52-3 (.945) to reach 100 wins. 42-13 (.764) to reach 90 wins. 33-22 (.600) to get to .500. 25-30 (.455) to avoid 90 losses. 24-31 (.436) to avoid 91 losses and their worst season since 2005. 16-39 (.291) to avoid 99 losses and their worst season since 1992 and ever in Los Angeles. 15-40 (.273) to avoid 100 losses. 11-44 (.200) to avoid 104 losses, the most in franchise history. 4-51 (.078) to avoid the worst winning percentage in franchise history. “… His stuff is average across the board: 88-92 MPH sinking fastball, average changeup and curveball, but he throws strikes and keeps the ball low in the zone. … In the majors, he projects as a fifth starter or more probably a long/middle reliever. I’ve see him as a sleeper in the past but he’s never quite woken up. Grade C.
I’m not gonna brave-face this one. Today’s Dodger game got off to a bitter start for me with the first-inning news that Trayvon Robinson, a Dodger prospect I had been eager to see for some time, had been traded away. The hope that the bitter might turn to a short-term burst of sweet mostly ended right after shortstop Dee Gordon’s acrobatic catch-and-tag of leadoff batter Willie Bloomquist trying to steal second base in the first inning. The rest was a slog: a 6-3 Dodger defeat. Rubby De La Rosa allowed two home runs in the second inning and remarkably reached the 100-pitch mark before his fourth inning ended. He finished with 103 pitches, but his relievers hardly accelerated the pace. By the time it was over, five Dodger pitchers had sent a whopping (and I don’t use that word recklessly) 209 pitches to get through the afternoon. The nadir was another lost performance by Hong-Chih Kuo, who allowed four baserunnners in his 28-pitch inning, including a two-run homer to left-handed Gerardo Parra, his second blast of the game and 15th of his career in 343 games. Kuo is lost like a castaway, an unfortunate metaphor for this adrift 2011 Dodger team. Of course, just like those any of those three newly acquired prospects could surprise and become useful major-leaguers, the Dodgers could surprise and come back today. Even on a dismal day, is there anything better to do than hope? Down 6-1, Los Angeles scored once in the bottom of the eighth. In the bottom of the ninth, Jamey Carroll walked and Gordon singled. One out later, Tony Gwynn Jr. singled home Carroll, meaning that, after Aaron Miles flies out, a 4-for-4 Andre Ethier was the tying run and a 2-for-4 Matt Kemp was the winning run. Potential 2012 starting outfielder Trayvon Robinson, 23, has been sent by the Dodgers to Seattle as part of a three-team trade that brought Boston minor-leaguers Tim Federowicz, Juan Rodriguez and Stephen Fife to the Dodgers. Erik Bedard was the main prize of the deal, going from the Mariners to the Red Sox. For the Dodgers, the key to the deal appears to be Federowicz, a catcher who will contend for playing time in Los Angeles next year. I think I might have been happier with Mark Brendanowicz. Turning 24 on Friday, Federowicz only has a .337 on-base percentage and .397 slugging percentage, however, with Double-A Portland in the Eastern League. SoxProspects.com praises his defense. Rodriguez, a 22-year-old righthander, has pitched out of the bullpen this year and has 88 strikeouts in 59 innings (13.4 per nine), but with 32 walks and a 5.19 ERA. In Rookie ball last year, he pitched in 12 games, starting nine, with a 3.51 ERA and 9.4 strikeouts per nine innings. Fife, a 24-year-old righty, has a 3.66 ERA and 6.1 K/9 in 19 games (18 starts) for Portland. That’s a bit below what John Ely could brag about after pitching in Double-A in 2009 at age 23. For those three, the Dodgers gave up Robinson (24 in September), who has a .375 on-base percentage and .563 slugging percentage (26 homers) this year for Triple-A Albuquerque. Robinson, who has hit well on the road as well as at home this season, has had his fine year marred by striking out 122 times in 100 games. But it’s stunning to see him traded for such an offensively challenged catcher and two sketchy pitching prospects. In 2007, A.J. Ellis had a .382 on-base percentage and .409 slugging percentage in Double-A – better than what Federowicz has – and Ned Colletti does all he can to keep Ellis from getting regular playing time. The only rationale I can think of is that the Dodgers think they’ll do better in the offseason trying to find a proper left fielder than they would trying to find a proper catcher. Essentially, Robinson was not in their plans, and they decided to unload him to fill a positional need. But it’s still puzzling, because the trade feels less like a step forward behind the plate and more like a step backward in outfield depth. So, what’s Dee Gordon been up to? Since being sent back to Albuquerque on July 4, Dee Gordon has had a .402 on-base percentage and .500 slugging percentage with eight steals in nine attempts. In 92 plate appearances, he had the same number of walks and triples: four. There is little expectation for Gordon to be a quality hitter at this point in his career, but the hope is that these two months of major-league experience will help him get off to a faster start in 2012, when the Dodgers’ record mercifully returns to 0-0. In the meantime, enjoy the Roadrunner show. Still a chance of more trades being announced: The non-waiver deadline is 1 p.m., and sometimes the news trickles out minutes later. And then, of course, there can be waiver trades after the deadline. … Not only did he donate huge amounts of money to the Dodgers Dream Foundation over the last six years, but I will always recall a conversation we had at the sushi bar in our Pittsburgh hotel at the end of the 2008 season. He never really tells anyone about all that he does back home in his hometown of Loma de Cabrera, but we got to talking about the poverty he grew up around. He made a passing comment about the local hospital and how the residents know that if they can’t afford their bills, the hospital just bills him. It was unfathomable, but in his mind it was simply what he is supposed to do. 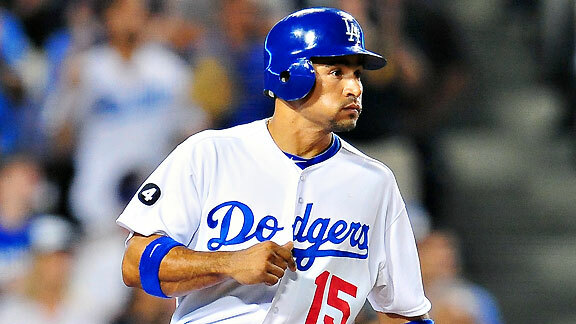 Outfielder Alex Castellanos, in the midst of a strong season in Double-A for Springfield in the Texas League, is coming to the Dodger organization to complete the Rafael Furcal trade, according to Tony Jackson of ESPNLosAngeles.com. The 5-foot-11, 180-pound Castellanos turns 25 next week, which puts him on the older side for Double-A, but he has made progress since being drafted out of Belmont Abbey College in 2008. This season, he has a .379 on-base percentage and .562 slugging percentage (sixth in the Texas League) with 19 homers, 21 doubles and 10 steals in 11 attempts in 93 games. He was named a starter in the Texas League All-Star Game (the story cited states that Castellanos, who played a little infield at the outset of his pro career but has been full-time in the outfield since 2010, has a “laser arm” in right). The main problem with Castellanos is plate discipline: He has 24 walks and 94 strikeouts this season. In 384 minor-league games, he has 94 walks and 366 strikeouts. Those ratios are huge warning signs as far as major-league success goes. Looking at the stats, it is pretty clear what type of player Castellanos is so far in his career. He will swing for the fences and is happy to go down swinging while trying. He will not try to work a walk and his OBP will not be much more than his (batting average). But when he hits the ball it will go very far and he has the ability to stretch a single into a double and double into a triple which helps his slugging numbers. Once on base, he also has dangerous speed to steal bases at will. Castellanos is an intriguing prospect based on his power and speed numbers, but will need to cut down on the strikeouts and add some walks to really push his prospect status to the next level. Castellanos would appear to be an offensive upgrade over Kyle Russell, the Dodgers’ 25-year-old Chattanooga outfielder who is at .331/.473 with 36 walks and 129 strikeouts this year. Here’s how Castellanos compares to Jerry Sands and Trayvon Robinson, who were 22 at Double-A in 2010, not 24 as Castellanos is now. I’ve also thrown in former Dodger Xavier Paul and former Cardinal Colby Rasmus for added context. Take all these comparisons with a grain of salt, of course. The numbers for the Dodger minor-leaguers came in the Southern League. One final comparison: Because this trade reminds me so much of the Milton Bradley-Andre Ethier trade, in that it involves getting rid of a player whom everyone knew had no future in Los Angeles for a Double-A outfielder, here’s how Ethier had performed leading up to that exchange. With Midland of the Texas League at age 23, Ethier had a .385 on-base percentage and .497 slugging percentage with 48 walks and 93 strikeouts. Castellanos was having a career year in Double-A (he ranks eighth in the Texas League in hitting, fifth in homers and fourth in runs scored), but he’ll turn 25 on Thursday and his tools don’t live up to his performance. He has some pop but he has a long swing and chases too many pitches out of the strike zone. His speed and defensive tools are fringy, and the former Belmont Abbey (N.C.) second baseman fits best in right field. Despite his 2011 numbers, he doesn’t have the bat to profile as a big league regular there. He signed for $70,000 as a 10th-round pick in 2008. If that seems disappointing, consider that the alternative would have been that the Dodgers would be paying Furcal anyway while getting nothing in return. (MLB Trade Rumors calculated earlier in July that Furcal will not be a Type A or Type B free agent this offseason). Knowing that Furcal could break down again at any moment physically the way Bradley could be counted on to mentally, it was always unlikely that the Dodgers were going to get a can’t-miss prospect for him. But it will be understandable that some will point to Ethier and wonder why not. Gus Ruelas/AP Andre Ethier, seen here fielding a second-inning single, later made a catch that saved two runs. This looked like it would be another game that the Dodgers might win while people’s minds were elsewhere. There’s nothing scientific to it, but I can think of a few times when the Dodgers have cruised to victory this season while they were making headlines in other ways, whether with the McCourts or with today’s trade news. Tonight, Chad Billingsley settled down after Andre Ethier’s great catch saved him from getting blasted in the second inning, and Matt Kemp hit another home run to put the Dodgers ahead in the third, and soon it looked like the game was on cruise control. But smart drivers stay alert. After the Dodgers built a 4-1 lead, Billingsley allowed a leadoff single in the sixth inning, then threw balls on 12 of his next 16 pitches to force home a run. Xavier Nady hit a sacrifice fly to make it a one-run game. Willie Bloomquist struck out, but Kelly Johnson became Billingsley’s fourth walk of the inning, loading the bases, and the Dodger starter was done. It took Matt Guerrier one batter to make it hurt even worse: a bases-clearing double from Justin Upton that propelled Arizona to a 6-4 victory. Billingsley had pitched into at least the sixth inning 16 times this year and allowed only six total runs in that frame before the five sixth-inning runs he was charged with tonight. Gary A. Vasquez/US Presswire Except for Bill Russell, Rafael Furcal reached base more than any shortstop in Los Angeles history. 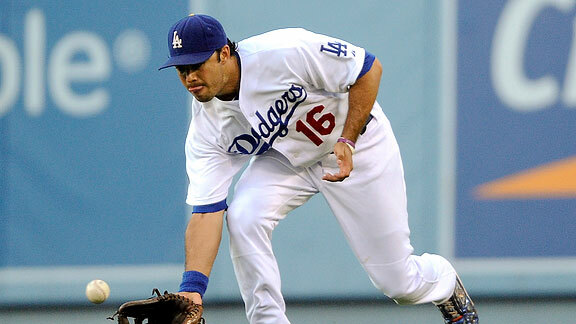 When Rafael Furcal first signed with the Dodgers, he had recently turned 28 and had averaged 152 games and 687 plate appearances over the previous four seasons, with a .342 on-base percentage, .418 slugging percentage and .794 stolen-base percentage. He wasn’t spectacular offensively, but he was solid and a step up from Cesar Izturis and Alex Cora, who mainly manned the position over the previously six years. Coming from Atlanta, Furcal was no Andruw Jones. Though his first month was below par, Furcal snapped out of it and got better as the 2006 season went on, OPSing .963 after the All-Star break and helping the Dodgers reach the playoffs. Of no small significance, he played in 159 of 162 games and started 156 of them. Furcal missed the first nine games of the 2007 season and the last 12 as well, but in between he played in 138 out of 141. That year, he didn’t have that great finishing kick (nor did the Dodgers), and finished with only a .687 OPS. However, it wasn’t really until year three that the Furcal that will linger in the minds of many Dodger fans emerged. He blasted out of the gate like never before as a Dodger, playing in each of the team’s first 32 games with an MVP-caliber .448 on-base percentage and .597 slugging percentage. To put that in perspective, that’s hotter than Matt Kemp this season. And then, he was sidelined until the final week of September. The Dodgers (thanks in part to a guy named Manny Ramirez) made the playoffs despite this, and Furcal went right into the fire of the postseason. He reached base in seven of his 15 plate appearances in the Dodgers’ Division Series sweep of Chicago, leading a dominant team performance that convinced numerous pundits to make Los Angeles favorites to reach the World Series. Game 1 of the NLCS remains, for me, the most pivotal game of Rafael Furcal’s Dodger career. In the sixth inning, with the Dodgers leading 2-0, Furcal (0 for 4 that night) rushed a throw and made an error to allow Shane Victorino to reach first base. The next batter, Chase Utley, homered off Derek Lowe to tie the game, and Pat Burrell sent the go-ahead run out of the park one batter later. It’s not that I’m pinning responsibility for the defeat on Furcal, but that throwing error remains as much a moment of wondering “what might have been” as Cory Wade’s and Jonathan Broxton’s pitches in the eighth inning of Game 4 are. Furcal came back in 2009 to, without looking at things too closely, essentially repeat his 2007 season – with the main difference being that the Dodgers had the offense to withstand his deficiencies and return to the postseason. Again, Furcal shined in the NLDS triumph and floundered in the NLCS disappointment. At the start of this season, I had practically given up on Rafael Furcal. Last year was limp, and his brief fireworks in 2008 looked like the death throes of a player just before his back was hijacked by the devil. He seemed, to adapt one of the most malleable and miserable of baseball cliches, an old 32. Maybe in an honest attempt to be objective, maybe in an attempt to be too clever, I picked Furcal as the Dodgers’ hidden weak link. While everyone else was worried about the starting pitching or Manny Ramirez, I was the one who so smartly pointed out that the Dodgers had a fizzler as the backbone of their infield. Turns out, that fizzler has been the most valuable shortstop in major league baseball — All-Star snub be damned — according to Fangraphs. That Furcal has made me look so wrong is wonderful. That he has done it in a year of personal tragedy is wondrous. How did he go back to work so quickly after his father died? And how did he go back so well? Furcal is a player of tremendous ability — he quite possibly will leave the Dodgers at the end of 2011 as the greatest-hitting shortstop in their long history — and, if it may still be said, somewhat maddening inconsistency. At times like these, with a .443 on-base percentage and .667 slugging percentage since June 4, he is arguably the best player in the game, punctuated by the spring in his defensive step. But even this year, Furcal has had his struggles. Thanks to more injuries and more ill production, Furcal reached base only 13 times compared with 11 strikeouts over a six-week span from April 22 through June 3. To put it in the best possible light, Furcal has an uncanny ability to remind you that he is all too human. He’s one of us. Until he’s not. Furcal will cool off again, maybe starting tonight. And one of these days, months or years, he won’t heat back up again. After all, he’s an old 32, right? But someday, after it’s all over, I hope I remember these inspiring weeks, when Furcal not only found life worth living in a dark hour, he made it that much more rewarding for the rest of us. Should Rafael Furcal’s trade to St. Louis become official, some will look back on all the money spent on Furcal and all the games missed, not to mention his lost year of 2011, when he managed to reach base only 41 times in four months. I’ll look back on Furcal as a guy who, each time he was signed, was worth taking a risk on. He was the most brilliant Dodger shortstop of my lifetime as a follower of the team. While I wish and hope for nothing but the best for Dee Gordon, his fleet and healthy feet will have some fly shoes to fill. Some online are questioning why Ned Colletti gave Hiroki Kuroda a no-trade clause. The answer is that it has value, just like money. Without the clause, Kuroda would have been much less likely to stay with Los Angeles as opposed to going elsewhere, such as back to Japan. It’s not clear at all that Kuroda would have taken a higher salary in exchange for not having a no-trade clause, but even if he had, what you then end up doing is paying him even more than he is worth, based on what at the start of the season was a relatively unlikely scenario of the Dodgers’ wanting to trade him. Plus, the added salary itself be an added impediment to getting a trade done. So no, the Dodgers don’t end up getting X players in exchange for Kuroda, and on some level, as Mike Petriello of Mike Scioscia’s Tragic Illness argues, that’s certainly a shame. But what they did get was four months and counting of a quality pitcher that they otherwise might not have had. Back in the offseason, when they were still trying to win in 2011, that’s a good deal. Juan Uribe, who hasn’t played for the Dodgers since July 23, has been placed on the disabled list, while Casey Blake, who hasn’t played since July 2, has been activated. Uribe could be activated as soon as August 8 – you can resume the Eugenio Velez Watch then. According to Jim Bowden and Jayson Stark of ESPN.com, Hiroki Kuroda has told Ned Colletti he prefers to stay in Los Angeles and is not going to waive his no-trade clause. It’s debatable what the Dodgers might have gained from trading Kuroda, but it’s hard not to be more than a little happy with someone who, amid all that has happened with the Dodgers this year, actually wants to be here in this city and/or with this team. Kuroda said Colletti hadn’t submitted any specific trades to any teams for his approval. Kuroda cited affection for, and loyalty to, his teammates as the reason for his decision. … Kuroda could choose to return to Japan after the season, when he again will be a free agent, but he said he hasn’t made that decision yet. As a player with 10 years in the majors and five with his current team, Rafael Furcal would have to approve any trade involving him. But there’s little reason to think he would block the deal that is close to being made, according to Jayson Stark of ESPN.com, that would send Furcal to St. Louis. The Dodgers, who are currently committed to paying Furcal’s 2011 salary, would reportedly end up paying a good portion of it even if the trade goes through. But it would give them the chance of receiving some immediate player compensation, while fully launching the Dee Gordon opera into its overture. St. Louis would be hoping it gets the Furcal who played well enough (and enough, period) to make the All-Star Game just last year. Danny Moloshok/AP Matt Kemp pumps his fist after driving in his fourth and fifth runs of the night with a single. These days, it’s almost strange to think the Dodgers play a team game. Baseball has always been the sum of its individuals, but when a given team has next to nothing to play for, those individual stories threaten to bury the team’s winning or losing. This is the time of year where someone’s fate is on the front page, and the final score is buried inside. Kenley Jansen has a heart scare. Hiroki Kuroda wonders who will be signing his August paychecks. Casey Blake tries to get healthy. And Matt Kemp and Ted Lilly battle for the Dodgers’ home-run lead. Tonight, Lilly allowed his 22nd and 23rd homers of the season, but Kemp kept some breathing room by hitting his 25th, while also driving in five runs to take the National League lead with 80. 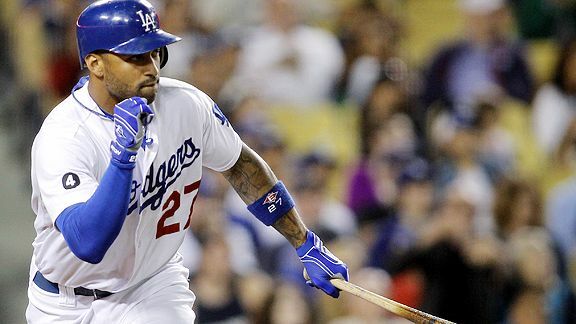 Kemp clinched the seventh 25-25 season in Dodger history, putting himself on pace for 39 homers and 42 steals this year, made a full-extension catch in the left-center gap and generally made this a happy happy fun fun night for the Dodgers. Who, by the way, won a loopy kind of game – and not a short one – 9-5. You thought I might forget to mention that, didn’t you? There was a reason for a team photo tonight, actually – as Vin Scully pointed out during tonight’s broadcast, it was the most runs scored by the Dodgers at home since August 4. Anyway, in case you think the Dodgers might mail it in over the final two months of the season, keep in mind that each and every one of them have something to play for, even if it’s only an individual story like pride for Lilly and Andre Ethier (who had three hits), the best possible 2012 contract for Rafael Furcal, Jamey Carroll or Aaron Miles (4 for 10 combined) or potential memorable league honors for Clayton Kershaw and Kemp. Kenley Jansen has gone on the disabled list with a cardiac arrhythmia, and Josh Lindblom has come from Chattanooga to replace him, reports Tony Jackson of ESPNLosAngeles.com. Also, Carlos Monasterios has had Tommy John surgery and will be out for approximately one year.